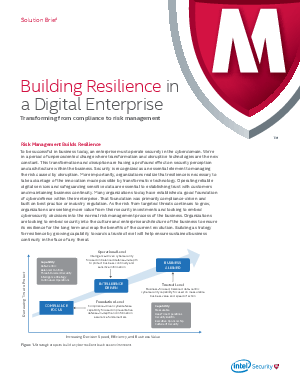 Organizations are looking to embed security into the culture and enterprise architecture of the business to ensure its resilience for the long term and reap the benefits of the current revolution. Building a strategy for resilience by growing capability towards a trusted level will help ensure sustained business continuity in the face of any threat. This solution brief outlines how security operations must evolve to a continuous operation focused on assessing readiness, acquiring and integrating threat intelligence, and increasing the speed of threat response capability.